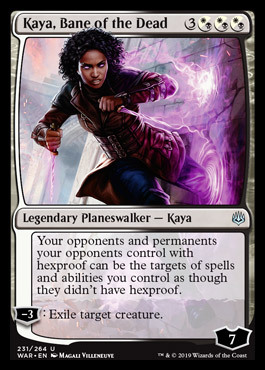 What dead is she bane-ing by getting rid of hexproof? There are 0 Hexproof Zombies, 1 Hexproof Vampire, and 5 Spirits (one of which doesn't have Hexproof but gives you Hexproof which this still gets past). Of those the Vampire is in Standard and I think I've seen it as one or two offs in the proper colors so I GUESS there kinda. Okay I guess Geist of Saint Traft, Drogskol Captain and Rattlechains do all give this valid targets even if Rattlechains doesn't have it itself and just grants for one turn. So I kinda half take back what I said but not fully unless we get hella Hexproof dead/undead in WAR. It's just a representation of her ability to kill the unkillable. Need foil for the shiny purples.